PHOENIX, Arizona, November 12. THE December edition of Swimming World Magazine is en route to the printers, but it's not too late to start your print subscription with December's World Swimmers of the Year issue. Every December, Swimming World Magazine names the best of the best in the world of aquatic sports. Through an intensive international polling process, Swimming World Magazine names the American, Pacific Rim, European, African and World swimmers of the year, along with the diving, water polo, synchronized swimming and disabled swimmer of the year awards. 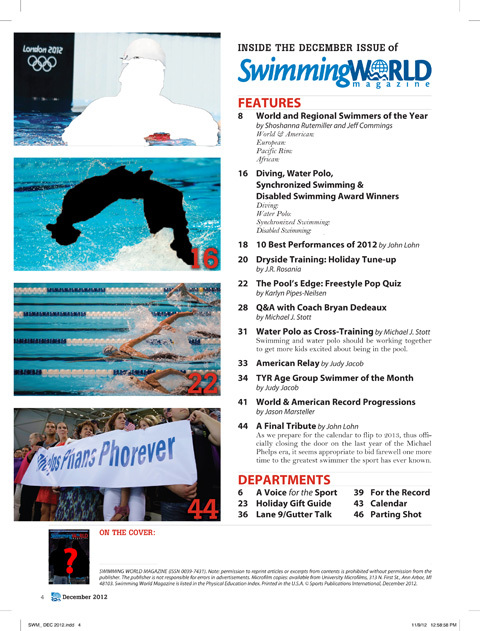 Want your own December World Swimmers of the Year issue? CLICK HERE and order your copy today!